Friday Afternoon Forecast Discussion – 3:30 p.m.
Good Friday afternoon!! Another warm day ahead of us Saturday with temperatures reaching into the middle 60s across West Alabama. We’ll start off the new year with a burst of cold air. Sunday morning starts out in the mid 40s with afternoon temperatures getting into the low 60s. We could see some showers Sunday afternoon or evening, just a slight chance across the area. All of the rain is out of here in the overnight hours. Then another cold front moves through bringing high pressure and cold conditions. The high pressure will clear out the skies and allow overnight temperatures Monday and Tuesday to drop into the teens around parts of our area. An arctic airmass is hanging around this low and we are due for some very cold nights. 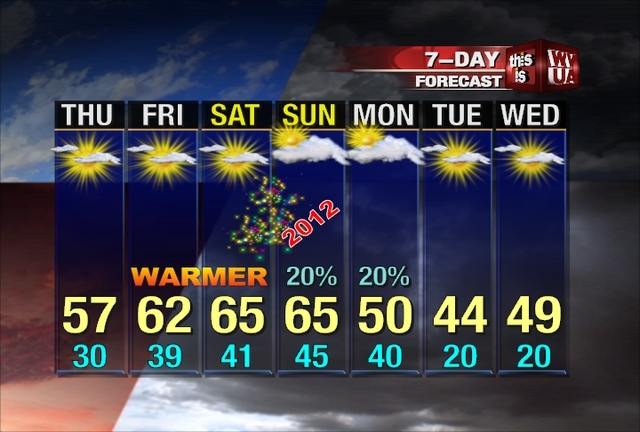 For the remainder of the week lots of sunshine around West Alabama. Afternoon temperatures will start to warm each day and may make it back to the 60 degree mark by the end of the week. Overnight temperatures warm slightly but stay in the low to mid 30s through the end of the week. Tune in tonight to WVUA for the news at 4, 5, 6 & 10 to get the latest Home Team Forecast. Here’s some sunsets across parts of Alabama this evening. Send us your weather pictures! Send them to weather@wvuatv.com. Also, look us up on facebook and twitter by searching weather@wvuatv.com or searching WVUA-TV Weather. We also have a new like page on facebook, called WVUA-TV Weather. Since we’re running out of room on the friend page, I recommend you like us on facebook. Great way to get weather updates! Also, join us live on WVUA-TV weekdays at 4, 5, 6 and10 pm and weekends at 10pm for the very latest on your news, weather and sports. Good Thursday afternoon to you! With a retreating trough/cold airmass, sunshine sure made it feel much better this afternoon. Many spots have reached 60 degrees, but areas northeast of Tuscaloosa have stayed in the 50s all day. As moisture levels increase a tad, lows won’t get as cold tonight. Look for temperatures to fall into the upper 30s to lower 40s tonight. Some ridging will nudge in from the west on Friday and Saturday. This will allow temperatures to warm well into the 60s. I wouldn’t be surprised if some spots reach 70 both Friday and Saturday. We can expect a good supply of sun through the first half of the weekend, but some changes will take over on Sunday. If you have plans outdoors on New Year’s Eve, look for a good supply of sun, with a high between 66 and 69. Temperatures will fall into the upper 50s by 7pm and lower 50s to upper 40s at midnight. There is no chance of rain at this point for your New Year’s Eve night. A deep upper air trough will dig northwest of Alabama on Sunday. This will send a cold front into the deep south during the afternoon hours on Sunday. Since moisture levels are low, I don’t expect much rain on Sunday, but moisture may increase just enough to squeeze out a few showers. 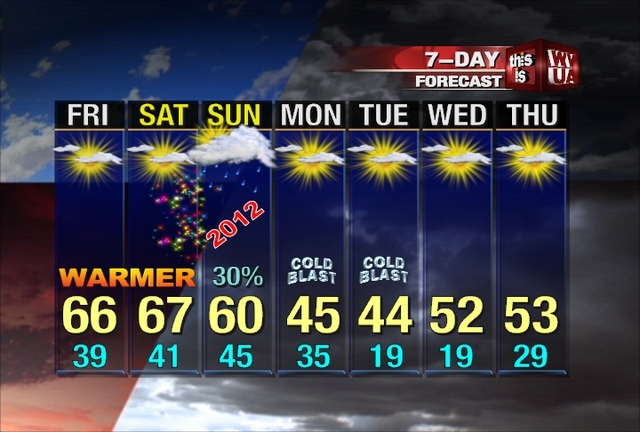 Skies will become mostly cloudy to start off Sunday of 2012. Expect an afternoon high close to 60, but temperatures will fall quickly later in the day as an arctic airmass dives southward. We will experience some of the coldest air so far this season, with highs in the upper 30s to lower 40s on Monday and Tuesday. As a strong high pressure moves in Monday night and Tuesday night, lows will fall into the upper teens to lower 20s. Sunshine will return on Monday and Tuesday. Some data brings another upper air impulse into the area towards mid-week. This system looks moisture starved, but some extra clouds could move in on Wednesday and Thursday. Sunset near Pennington – Goodloe Sutton, a photo by WVUA-TV on Flickr. 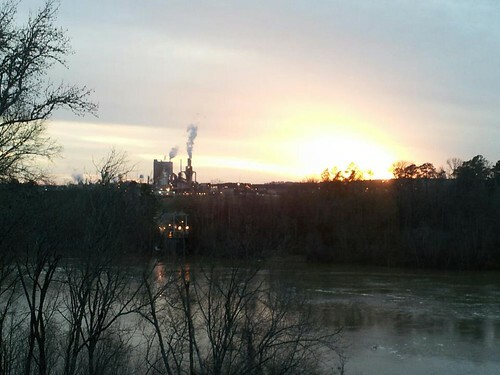 This sunset picture is taken from the Marengo County side of the Tombigbee River near Pennington. Be sure to send us your weather pictures! Send them to weather@wvuatv.com or log onto flickr and tag us. We often show weather pictures on our blog. I want to send out a special congratulations to my sister Kimberly and her husband Nathan! 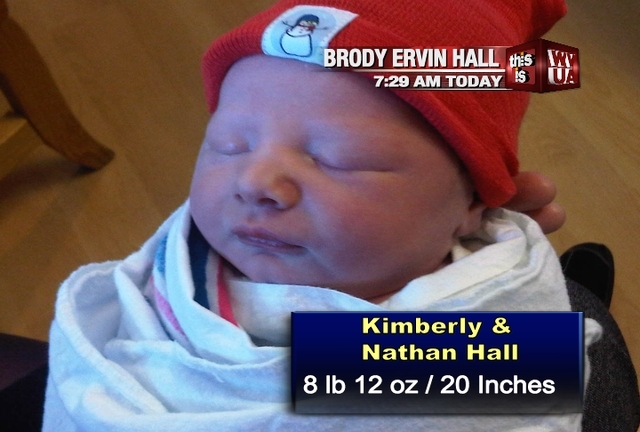 They brought Brody Ervin Hall into the world early this morning. He was born at 7:29am and weighed 8lb, 12oz. I got a chance to see my new little nephew at St. Vincent’s hospital first thing this morning in Birmingham. Good Wednesday to you! A little cloud-cover has moved into much of the area this afternoon, but much of the day has featured sunny skies. The extra clouds are in response to a fast moving upper level disturbance. While this disturbance is moving through our area, the air is too dry to bring any rain. Temperatures are still cool today, with many spots topping out in the lower to middle 50s. The trough that has brought the much colder air to the east and south is moving out. As heights increase a bit, temperatures will warm as well, especially by the weekend. Conditions are fairly calm over much of the US today, as a large area of high pressure keeps things in check. The surface high will move east of our area tomorrow, and a south wind will develop. This will increase moisture, so expect skies to become partly cloudy late this week and into the weekend. Temperatures will also modify a bit, as the warm airmass over the Gulf moves our way. Expect highs in the upper 50s on Thursday and lower 60s on Friday. While moisture levels increase, lows will warm as well. Expect a low of 30 tonight, but upper 30s are likely on Thursday night and 40s through the weekend. A sharp cold front will push through the area on Sunday and Monday. This will bring some very cold temperatures to the deep south and much of the US. If forecast data is correct, Monday will feature highs in the 50s with falling temperatures during the afternoon. Tuesday would be even colder, with highs in the upper 30s to lower 40s. As a surface high quickly swings into the southeast, temperatures may fall into the teens at night Monday and Tuesday night. At this point, I don’t see any sign of wintry weather.